One of the issues raised by the development of new technologies, is how they will impact our identity of human beings. 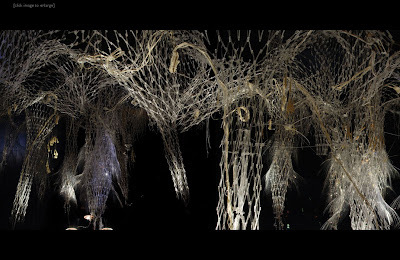 Interested in the conversation between art, science, technology and society, Fundación Telefónica has just awarded Philip Beesley with the first prize of their VIDA competition, dedicated to art and artificial art. A good pretext to introduce you to the work of this Canadian architect, artist & researcher, through his uncanny, poetical and fascinating immersive sculpture Hylozoic Soil. As We Make Money Not Art reports, Hylozoic Soil takes its cue from Hylozoism, the philosophical view that all or some material things possess life. It takes the shape of an artificial environment that seems to be made of the same substance as jellyfish, breathing like one, wrapping itself around you and exhibiting complex behaviour as you walk through it. Delicate arms made of a shape memory alloy called nitinol gently move in reaction to people's behaviour, while hanging pillars transmit a very quiet energy, miles away from the more direct and manly energy displayed by most robotic installations. Although the work manage to almost absorb visitors it has been developed using as little material as possible. The structure was expanded into an ethereal meshwork.